Experience the same cutting performance as a professional chef. The professional 8″ stainless steel blade provides a lasting razor sharp edge that performs time after time. 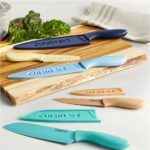 13Deal is offering Oneida Cutlery 8 Inch Chef’s Knife for $7.48 shipped. The innovative soft grip guides your hand to the optimal position on the knife for maximum control and a superior cutting experience.